with Lance reaching the summit Mount Weather with the lead group of “crazy fast, crazy strong” guys. We in part credit this to Lance’s new sub-15lb S-Works Tarmac – as Sunday was it’s maiden ride outside. Gordan, Shauna and Emily were out as well, with Shauna and Em riding a bit more leisurely in part due to an epic Computrainer “Throw Down” session on Saturday (where thankfully no one got hurt, but power levels were tested and a boy might have been out-sprinted on a final climb …) Regardless, everyone finished the ride with a smile and a burger at Foster’s Grill. 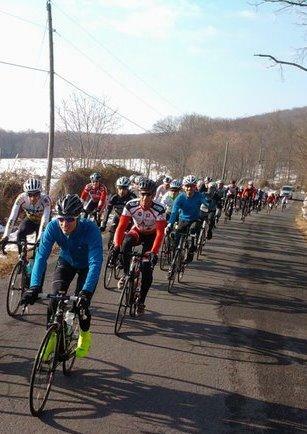 Here’s to winter training rides! VeloWorks-Spokes, Etc.’s season is off to a great start – strong training rides and one race under the belt, and if things keep up, it’s looking to be quite a successful season for the new team!